Globular Amphora culture. 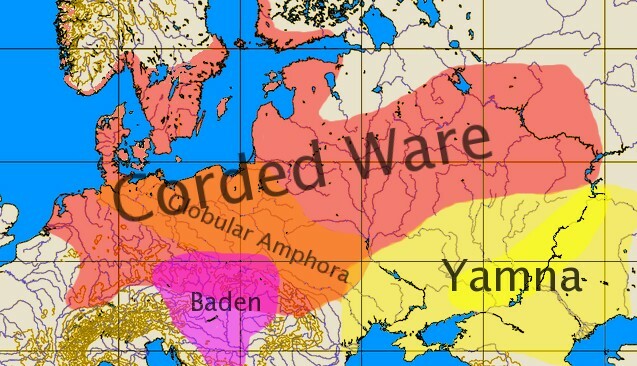 Archeological culture of the Eneolithic Period that was widespread in territories now comprising eastern Germany, Czech Republic, Slovakia, Poland, Ukraine (only the Volhynia and Podilia regions), and Moldova. Today three variants of the culture are distinguished: the Western (covering Germany, Czech Republic, Slovakia, and western Poland), Central (Poland), and Eastern (Ukraine and Moldova). In Ukraine the Volhynian version is distinct from the Podilian. Since the end of the 19th century about 70 burial sites, but no settlements, have been discovered in Ukraine. The dead were buried in a flexed position in rectangular sarcophaguses built of stone slabs. Group burials of what appear to be whole families were common. Cremation was rare. Various pieces of earthenware such as amphoras, tools such as stone axes and wedges, and ornaments were buried with the dead. The amphoras had a globular body, cylindrical neck, two to four handles, and a flat or concave bottom. The tribes of the Globular Amphora culture lived in large patriarchal families and practiced animal husbandry and perhaps plant cultivation.